When you're setting up a Hackintosh, the single most important tool in your process will be the bootloader, which is the program that enables your computer to "boot" Mac OS X. Ever since the release of OS X El Capitan in 2015, the new Clover Bootloader has rapidly become the most popular bootloader within the Hackintoshing community, and for good reason: compared to the old Chameleon/Chimera bootloaders, Clover offers faster boot times, more features, and better hardware compatibility. However, Clover can also be a bit tricky to work with, due to its use of a feature called the "EFI partition" (also known as an EFI system partition, or ESP). Just what is the EFI Partition, and how do you use it? That's what this guide is here for. What is the EFI partition? Essentially, the EFI partition is a special 200-megabyte partition that is created on your computer's hard drive when you first install Mac OS X, Linux, or newer versions of Windows. Apple originally used the EFI partition to help real Macs boot OS X (although real Macs don't really need it). Clover modifies the EFI partition so that regular PCs can use it to boot OS X as well. Generally, this is good news for compatibility- thanks to Clover's use of the EFI partition, you can now update your Hackintosh's installation of OS X directly through the Apple App Store, often without having to reinstall your bootloader or any of your Hackintosh-specific kexts. Everything is preserved on the EFI partition. 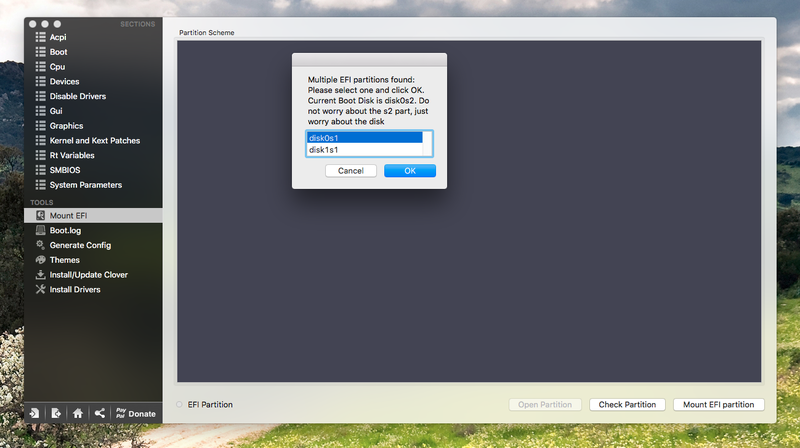 However, the EFI partition is relatively difficult to work with, because it is hidden by default when OS X boots. 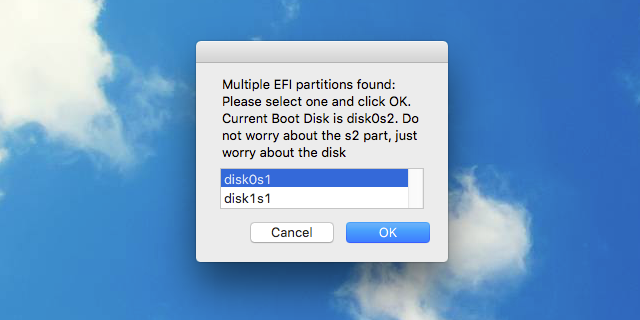 More specifically, OS X doesn't bother to "mount" the EFI partition when it normally boots. Unfortunately, if you want to change any of the settings for Clover bootloader, mounting the EFI partition becomes absolutely necessary, since all the configuration files for Clover are stored inside the partition. The easiest way to mount your computer's EFI partition is by using the free "EFU Mounter v3" app, which is available to download on tonymacx86. The app itself is very simple to use. Simply download it, run it, and enter your OS X system password. If your computer has multiple hard drives (like mine), choose the hard drive that OS X is currently booting from. In the screenshot below, EFI Mounter tells me that I'm currently booting from disk0s2, so I choose disk0s1 (because it's part of "disk0"). Now that your EFI partition has been mounted, you can adjust the settings of Clover bootloader to your liking. For more details, check out our guide on setting extra boot flags for Clover bootloader. Alternatively, you can mount your EFI partition from the free Clover Configurator app, which is also our recommended tool for adding boot flags to Clover. Once you've downloaded it, open up the Clover Configurator app (which comes in a ZIP file). To mount the EFI partition from this app, click on the appropriately-named "Mount EFI" button in the left column. Then, in the page that comes up, click "Mount EFI partition." If you have multiple hard drives, it's the same as with EFI Mounter: choose the hard drive that OS X is currently booting from. Once that's done, you can return to the homepage for Clover Configurator by clicking the house icon the bottom left. Now that your EFI partition has been mounted, you can use Clover Configurator to adjust the settings of Clover bootloader to your liking. For more details, check out our guide on setting extra boot flags for Clover bootloader.